In April 1939, the New York Zoological Society (NYZS) presented their Zoological Wonders pavilion to the public at the very first New York World’s Fair. The 1939-40 Fair brought highlights from the New York Zoological Park in the Bronx and the New York Aquarium in Manhattan to Flushing Meadows in Queens. 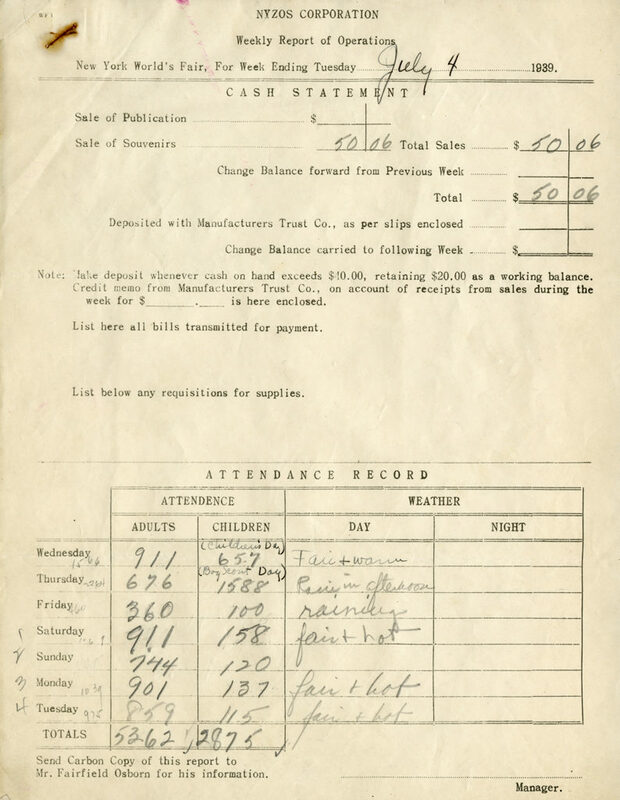 In this month’s post from our NHPRC grant project, we are presenting a selection of materials unearthed from records from the NYZOs Corporation, a former NYZS subsidiary created to coordinate the Society’s participation in the 1939-1940 World’s Fair. Fairfield Osborn Jr., the Secretary of the Society’s Executive Committee at the time, managed that participation in his last task before becoming the Society’s President in 1940. As such, the World’s Fair materials illustrate the beginning of a new era at NYZS. 1. Photograph of the exterior of the Zoological Wonders building at the New York World’s Fair in Flushing Meadows, Queens, circa 1939-1940. Scanned from Saving Wildlife: A Century of Conservation, page 125. Donald Letcher Goddard, Wildlife Conservation Society. 1995. 2. Color illustration of the exterior of the Society’s Zoological Wonders pavilion, unknown artist, circa 1940. The thumbnail sketch was submitted to Ellen Fischer at the World’s Fair Department of New Yorker magazine in April 1940. Scanned from WCS Archives 1939-1940 New York World’s Fair records. 3. 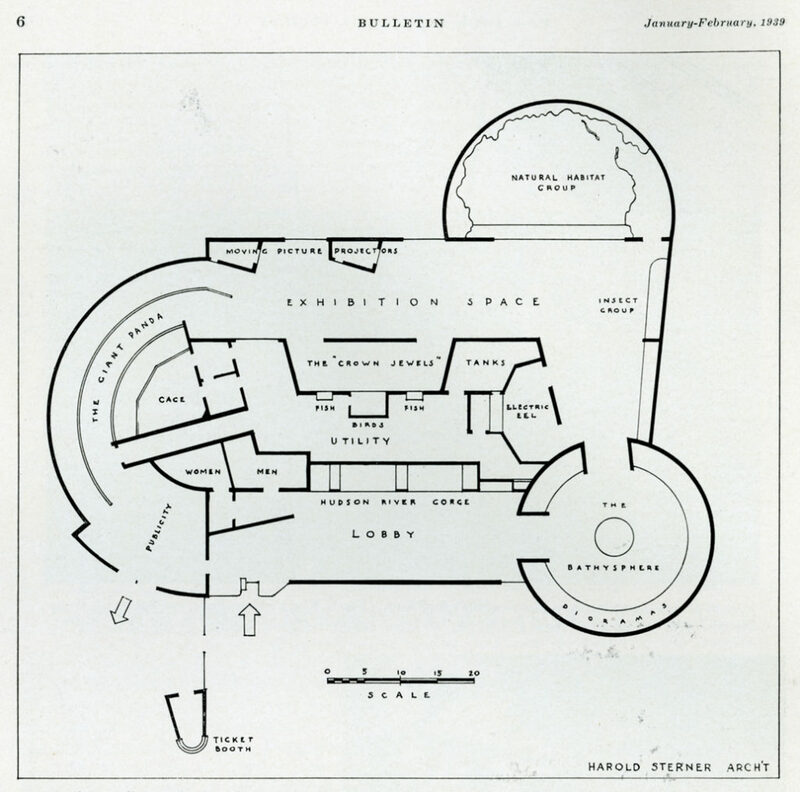 Floor plan by architect Harold Sterner representing the NYZS’s exhibit layout, circa 1939. Published in the article by Fairfield Osborn, “Our Building at the World’s Fair,” in advance of the opening of the first season of the Fair in April 1939. The original blueprints are held by WCS Archives. Scanned from Bulletin – New York Zoological Society, Vol. XL11, No. 1, page 6. New York Zoological Society. January-February 1939. 1, 2 & 3. The Society’s Zoological Wonders building was designed by architect Harold Sterner and associate architect Samuel Oxhandler and opened to the public during the first season of the Fair in April 1939. 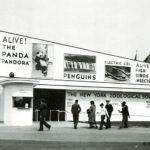 The pavilion featured highlights from the Bronx Zoo and New York Aquarium such as introductory panels that noting the history of the Hudson River Gorge, prominent exhibit space for Pandora, the famous giant panda, and William Beebe and Otis Barton’s well-travelled Bathysphere. Other exhibits included displays of creatures representing the insect world by Curator of Herpetology Raymond Ditmars (given the additional role of Curator of Insects in 1940), and fanciful birds whose exhibit area was marked on the plan as “The Crown Jewels.” NYZS’s pavilion also featured fish from the deep sea, a Natural Habitat Group, and an electric eel from South America named Electra. Screenings of motion picture films produced by the Society were also available on view. 5. 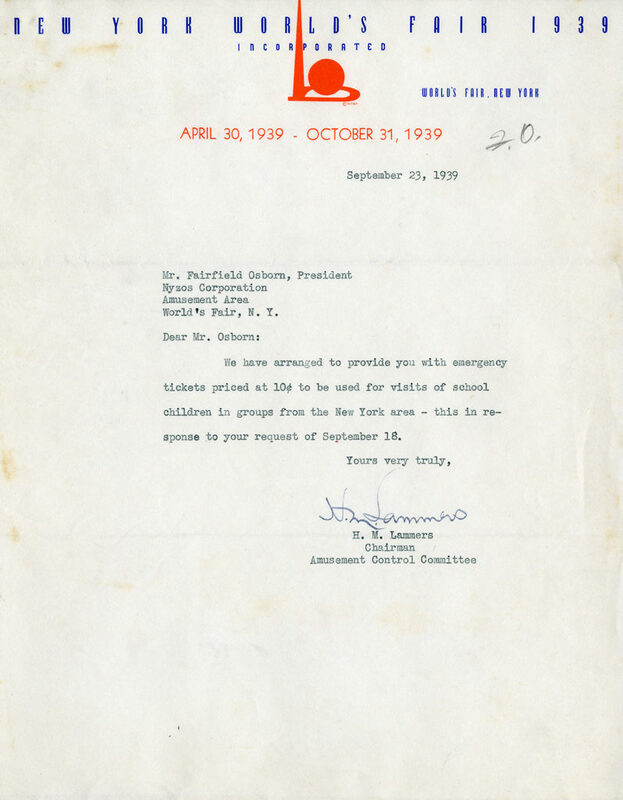 Correspondence from the Amusement Control Committee of the New York World’s Fair 1939 to Fairfield Osborn, President of NYZOs Corporation during the first season of the Fair, September 23, 1939. The Society’s pavilion was situated within the Fair’s Amusement Section. Scanned from WCS Archives 1939-1940 New York World’s Fair records. 6. 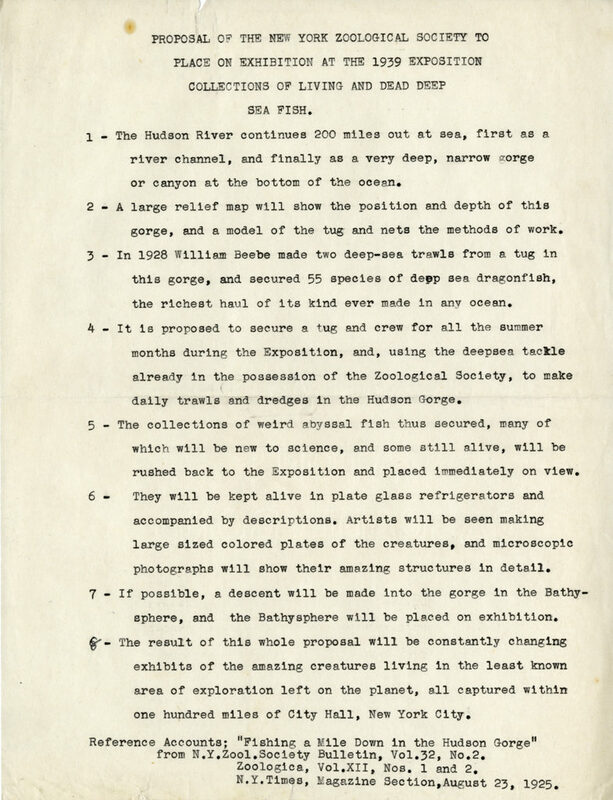 “Proposal of the New York Zoological Society to Place on Exhibition at the 1939 Exposition Collections of Living and Dead Deep Sea Fish,” circa 1939. Scanned from WCS Archives 1939-1940 New York World’s Fair records. 7. 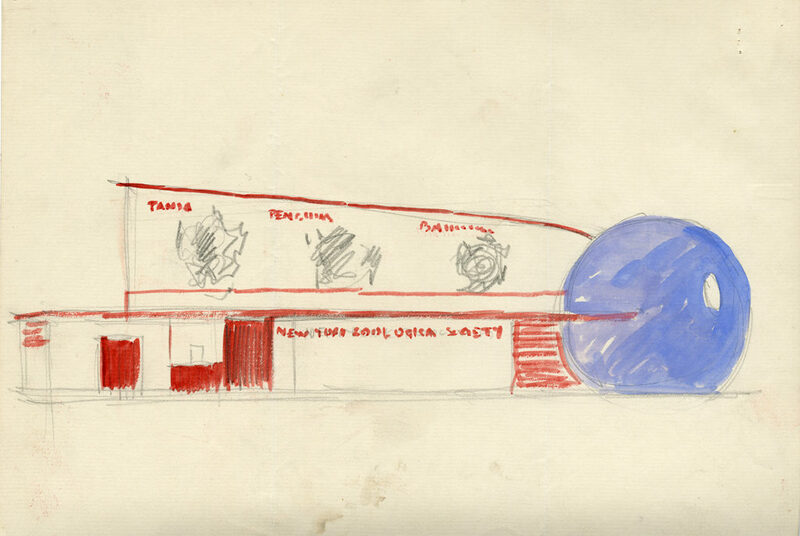 Pencil sketch illustrating an enlarged replica of the Society’s Bathysphere, a prominent feature in the pavilion’s design, circa 1939-1940. Scanned from WCS Archives 1939-1940 New York World’s Fair records. The initials in the annotation “from L.S.R.” refers to Laurence S. Rockefeller, who at the time held the position of Second Vice President of the Society (he would later move up to First Vice President, and was the President after Fairfield Osborn Jr.). 6 & 7. 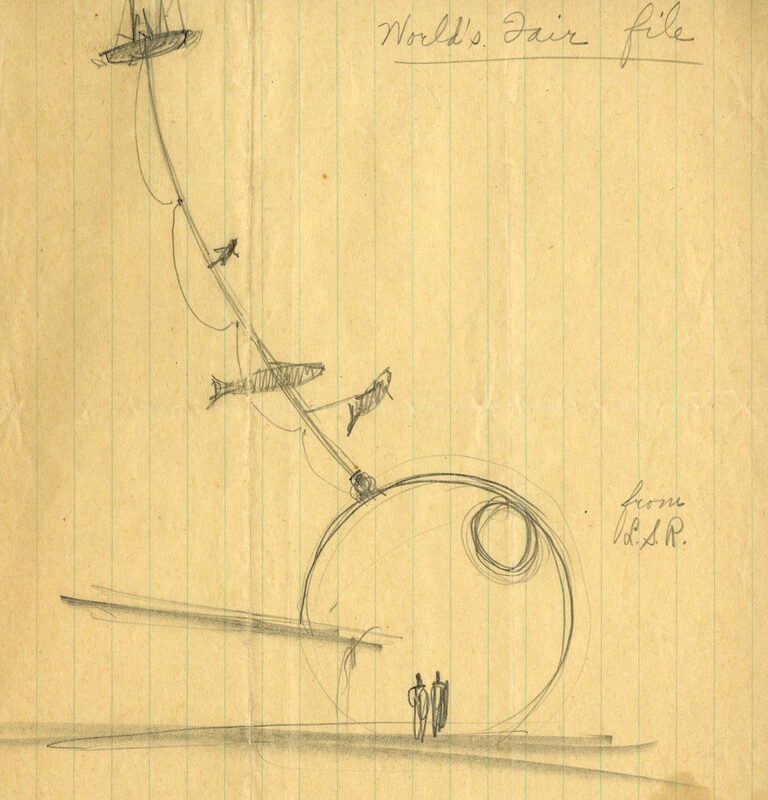 William Beebe and Otis Barton’s Bathysphere was the source inspiration for both one section of the Society’s Zoological Wonders building, as seen here in the imaginative sketch above, as a key element in the exhibit inside, and as reflected in several photographs within the New York World’s Fair 1939 and 1940 Incorporated Records held by the New York Public Library–a highlight of its promotional efforts. Also, as mentioned in the proposal above, NYZS had plans to undertake an exploration of the Hudson River Gorge using the Bathysphere, a giant submersible diving bell of the Society’s Department of Tropical Research, during the summer season of the Fair. The exploration would have collected deep sea or “weird abyssal” fish for live interpretation and study by Society artists, scientists, and the Fair-going public visiting the Zoological Wonders pavilion. 8. 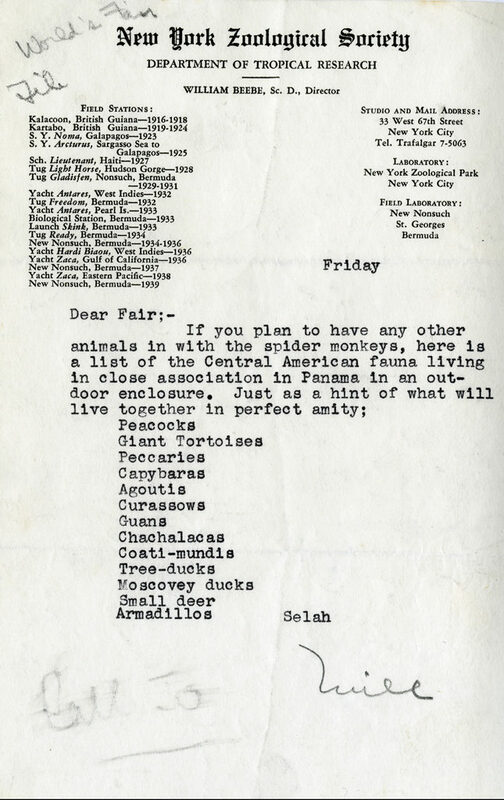 Letter from William Beebe of the Society’s Department of Tropical Research noting Central American fauna for potential additions to an exhibit of spider monkeys. Scanned from WCS Archives 1939-1940 New York World’s Fair records. 8. 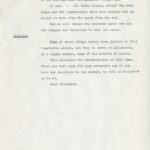 While this letter doesn’t appear to reflect what the Society ended up exhibiting at the World’s Fair, it does mirror the similar Live Habitat Group exhibit (also referred to as the Natural Habitat Group exhibit or the Natural Live Habitat Group exhibit), featured in the NYZS’s pavilion. 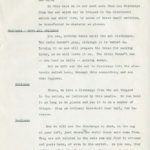 According to Fairfield Osborn, in his second article to address the World’s Fair-published in NYZS’s Bulletin at the conclusion of the first season of the fair (Vol. XL11, No. 6, page 183)-he noted the exhibit “as a laboratory test that proved eminently successful and aroused great popular interest” and predicted the exhibit would have major impact on Zoological Park developments in the future. This letter above hints at how the Society’s exhibition philosophy was changing in the late 1930s and early 1940s, as NYZS gradually moved away from ‘animals in cages’-type exhibits towards more holistic habitat-based groupings, such as the Bronx Zoo’s 1941 African Plains exhibit. 9. 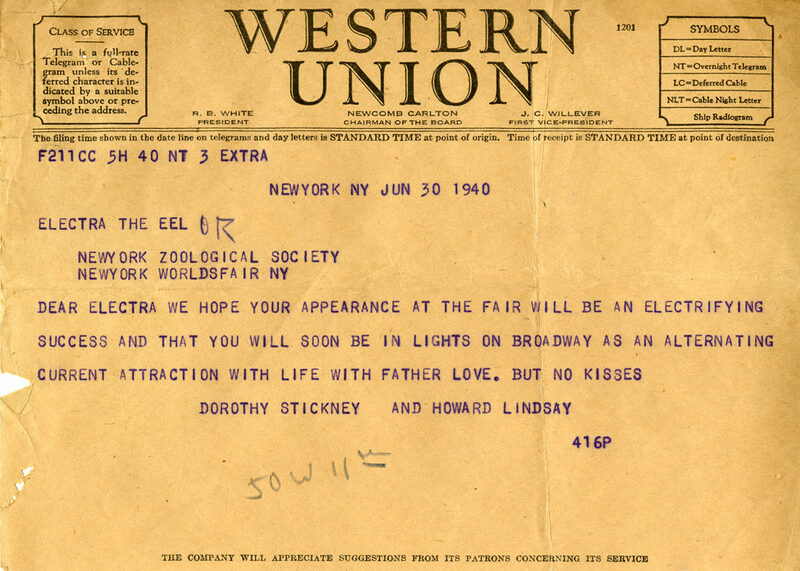 A Western Union telegram sent from Dorothy Stickney and Howard Lindsay to Electra the Eel or the New York Zoological Society, June 30, 1940. Scanned from WCS Archives 1939-1940 New York World’s Fair records. 10. 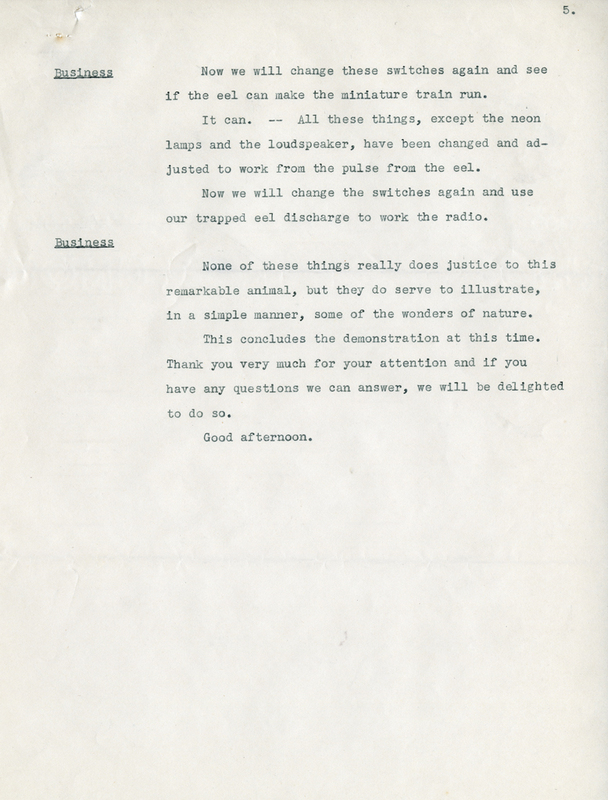 A Western Union telegram from Benjamin Javits to the New York Zoological Society, July 1, 1940. Scanned from WCS Archives 1939-1940 New York World’s Fair records. 11. 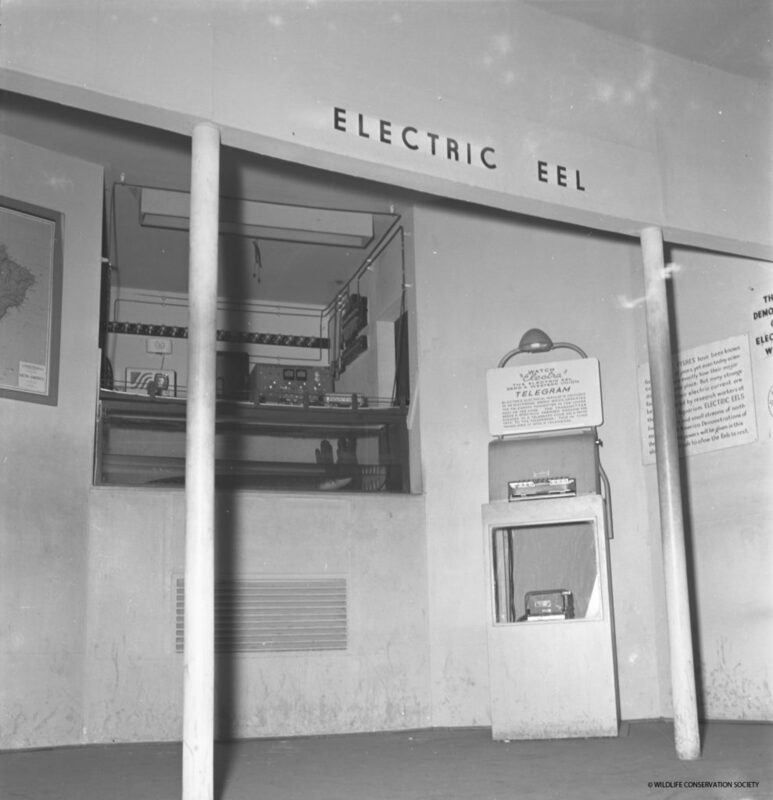 A photograph of the electric eel exhibit with a Western Union Telegram transmission station on the right, circa 1939-1940. Scanned from WCS Photograph Collection. 12 – 1. Page 1 here and pages 2-5 below. 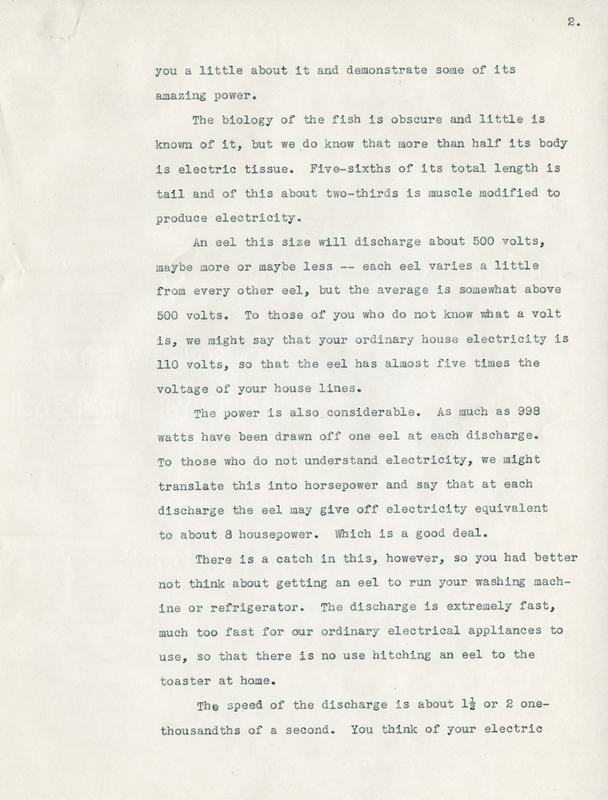 Script relating to a public demonstration at the electric eel exhibit, circa June 1940. Scanned from WCS Archives 1939-1940 New York World’s Fair records. 9, 10, 11 &12. The exhibit of an electric eel provided the public an opportunity not only to look at but also to learn about animal behavior up close and personal. During the Fair, visitors to Zoological Wonders had the opportunity to satisfy their curiosity through participating in several live demonstrations. 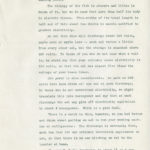 In a letter accompanying a script for a proposed public demonstration (see above), Christopher Coates (Aquarist for the New York Aquarium) writes to Fairfield Osborn and speaks of the challenges of and need to convey the science and wonders of the animal world to the non-scientist public. With Osborn’s approval (the letter is annotated “Noted – and told CW Coates this was an excellent idea. 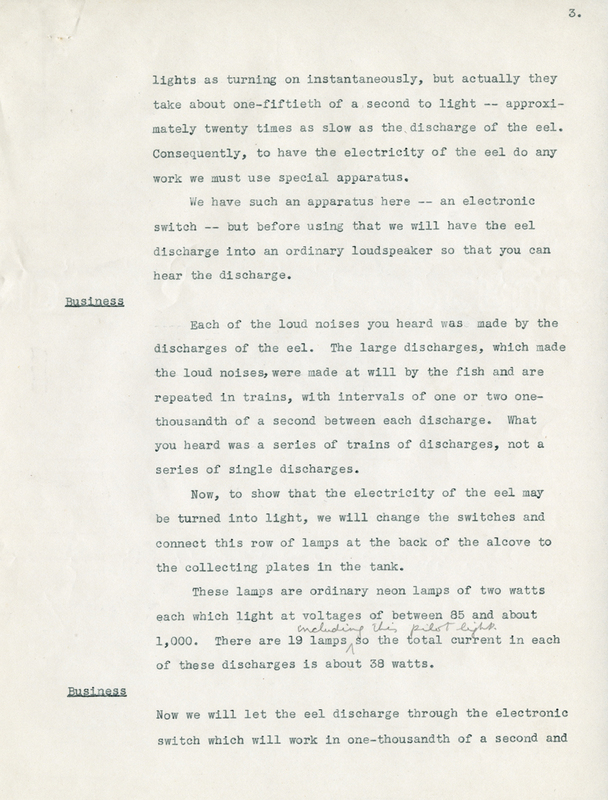 F.O.”, the public had the opportunity to participate in demonstrating Electra the Eel’s natural capabilities to produce electrical current. 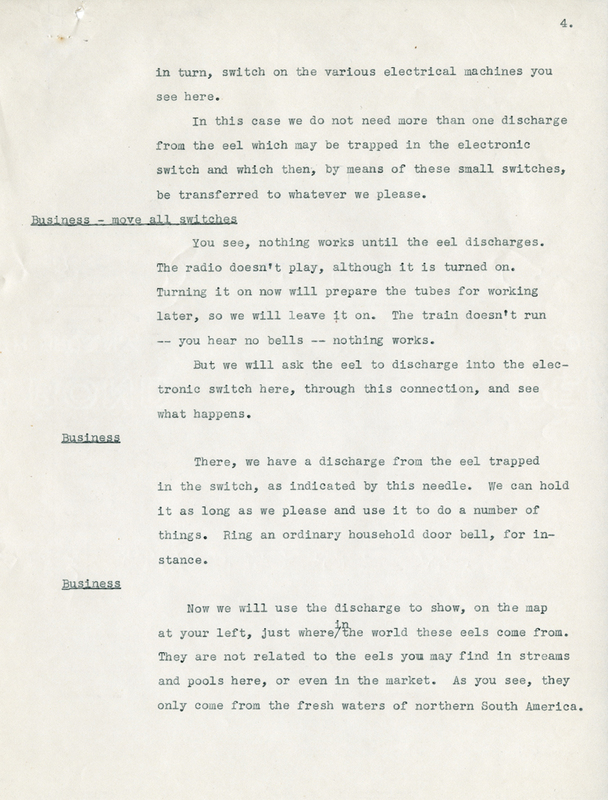 The WCS Archives holds what appears to be several eel-powered telegrams produced during the second season of the Fair, in the summer of 1940. 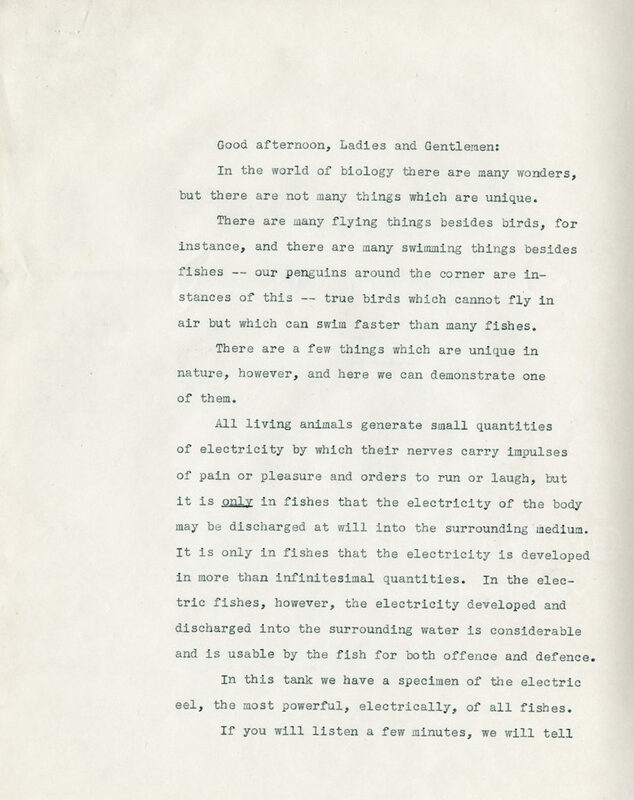 Following the end of the 1939-1940 New York World’s Fair, Coates continued to be involved in research investigating the capabilities of electric eels (facilitating medical research conducted by scientists at Yale, Columbia and Johns Hopkins Universities), as the New York Zoological Society became involved in the national war effort, upon the country’s entry into the Second World War. 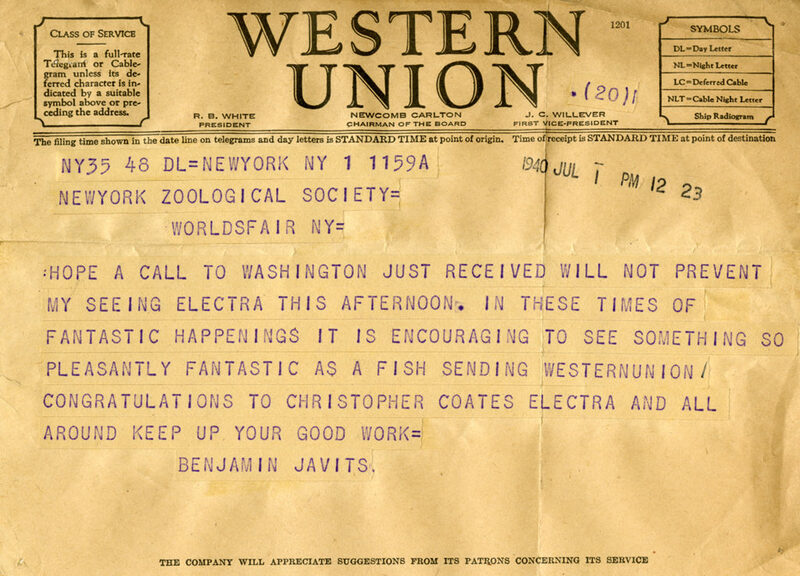 To see Coates, Electra and a young Zoological Wonders attendant demonstrate the “Watch ‘Electra’ the Electric Eel Send a Western Union Telegram” telegram transmission station, check out another great photograph from the New York World’s Fair 1939-1940 records held by the New York Public Library here. This post is the seventh in a year-long series dedicated to WCS’s National Historical Public Records Commission (NHPRC) funded archival processing project, which will make several important archival collections from the New York Zoological Society accessible for the first time. Thank-you Scott. 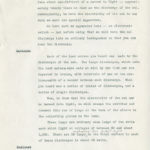 WCS Archives 1939-1940 New York World’s Fair records are predominately textual based materials, so it was great to be able to highlight those hidden archival gems with visual appeal, along with some of the surviving materials that represent the written record documenting NYZS’s experience at the Fair.